Raida was born on May 24, 1912 in a 3 room log cabin located by the dugway just east of the church and south of where her current home is located. Her parents were Ellen Ballingham and John T. Betteridge. 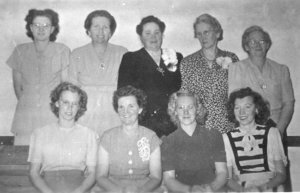 Raida had four brothers and 2 sisters; Wallace, George, Elva, Wilbur, Orland(Shorty) and Eva. When Raida was young her family moved to Ogden to look for work but her dad had a hard time finding any. Finally her father and two of Raida’s brothers found work with the railroad. He worked there for a while but he couldn’t seem to keep a job. He didn’t have any education and times were hard then anyway. It wasn’t easy to get work. Her family finally moved back to Grouse Creek and for a while they lived in the house where Eula and Lyman now live. At that time it belonged to her uncle and he was working for the railroad and living in Lucin at the time. 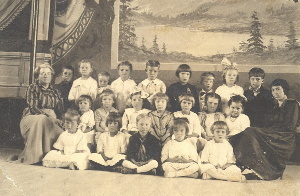 Raida attended school in Grouse Creek and remembers that there were 125 students at one time attending. There were three grades in each room. Most of the teachers were single and some ended up marrying members of the community. Music was a big part of Raida’s life. She learned to play by ear. She was just a little kid the first time she played, probably about 5 years old. They had an old organ and her brother would pump the pedals while she played sometimes, but she remembers going there and pumping with one foot and reaching up and playing. She recalls it must have been hymns because she didn’t know any other music. Raida remembers a guy came over here from Oakley that her dad knew. He came in there and he heard that she could play the organ and wanted her to play a tune. And if she would play a tune, of course, she had to be coaxed because she was just a little kid. If she would play a tune he would send her a box of candy. She finally played a tune for him, whatever it was and he sent the box of candy. She didn’t want to share it with anybody and ate so much she got sick. Raida was married to Ivan Kimber and their children are: Richard, Thurman, Marvin and Lynn. After Ivan and Raida were married, the lived for a time in what was called the Aunt Lizzie Cook house which was located by the old post office. She remembers all of the houses at the time had bed bugs and it was just awful. You hated to go to bed and the only thing they had to fight them was putting the bed legs in pans of kerosene. She was glad when they finally moved to Nevada and weren’t in that house anymore. It was during the depression and Raida remembers it as being a rough old life a lot of the time, but they persevered. Raida remembers that had no refrigerators. In the winter Mides pond would freeze solid and they would go saw out squares and put it in straw in a cupboard outside and then they would make ice cream or something. She thinks they drank some of it sometime, put it in some water, but it’s a wonder they didn’t all die. Ivan had an opportunity to get a place in Wells but it didn’t work out but it wasn’t because they didn’t work hard. Richard graduated from Wells High School. Ivan and Raida eventually moved to a home that belonged to Bill Cooke. Raida remembers they had had a boy that was about her age whose name was Charles. They also had a girl about the same age as her older sister. So, we were quite well acquainted with them and played back and forth to visit here. She has some boards that still have Bill Cook’s name on it. Raida played in the Grouse Creek Orchestra but doesn’t recall when she started but it was around World War II because they would have parties before the servicemen left and again when they came home. She recalls seeing Ira Warburton (who was a pilot) dance there and it was the last time she saw him alive. The dances at the time were all held at the church and it would be filled. When Raida first started playing in the orchestra, her uncle and even her brothers had harmonicas. Both Raida and Ivan eventually played in the orchestra. Raida remembers that Ivan was a little annoyed because she played at the dances and he was kind of left out. Ivan’s uncle, Carl Warburton played the saxophone and he gave him some things to start with and he just persevered until he could read music. The orchestra played all over the area. Not only did they play in Grouse Creek, but they played in Park Valley, Almo, and Yost and even went as far as Wendover once. Lyman Kimber, Grant Kimber, Claude Wakefield and Archie Toyn were all members at that time. 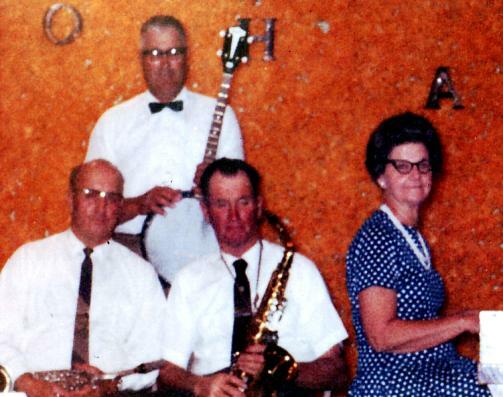 Grant, Archie and Ivan all played the saxophone. 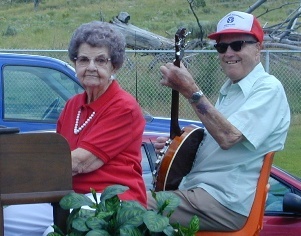 Claude and Lyman played the banjo. Raida remember Archie was quite talented because he could play the saxophone and guitar. Raida Ellen Betteridge died on July 20, 2011 in Brigham City, Utah. She is buried in the Grouse Creek Cemetery.